At the professional automotive exhibition AutoZum, held from 21 to 24 January 2014 in Salzburg, Austria, TecAlliance presented itself at its own stand for the first time in order to solidify and further expand the company image and brand recognition. With the presentation of new modules for the repair of electronic components, the expansion of the TecDoc reference data and the introduction of new filter options for vehicle search with the integration of the Vehicle Identification Number (VIN) the company underlines the importance of its customer orientation. The AutoZum with its 23,500 professional visitors and 310 Austrian and international exhibitors once again showed its importance as a professional exhibition for automotive products. The visitors showed great interest in TecAlliance’s solution portfolio: Thanks to the synergies among the united brands TecCom, TecDoc and TecRMI TecAlliance offers a comprehensive market solution for product and vehicle data, ordering and delivery processes as well as repair and maintenance information. All three business lines showed very good business development in all markets. 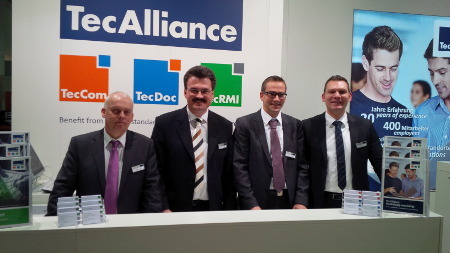 The TecAlliance sales employees (from left: Carsten Kuhl (Sales DACH), Bernd Dippel (Sales DACH), Markus Diesch (Sales Fleet & Leasing) and Daniel Sjögreen (Sales DACH)) were happy about the great interest from professional visitors. 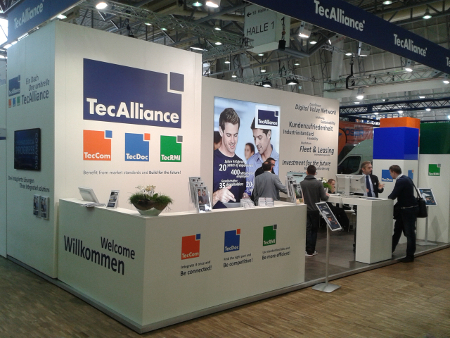 The TecAlliance exhibition stand shows the interplay among the integrated solutions from TecCom, TecDoc and TecRMI.